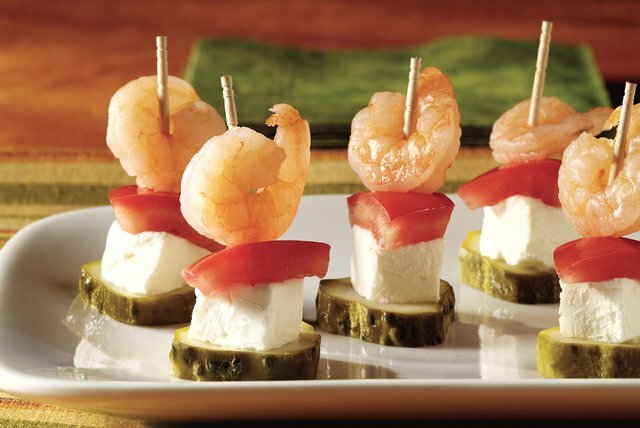 Stacks of pickle slices, cream cheese cubes, small shrimp and tomato pieces are secured with toothpicks. Serve on a platter and watch them disappear! Pierce each stack with toothpick. Arrange on serving platter. For best results, pierce pickle off center with toothpick. When entertaining, keep cold foods refrigerated until ready to serve. Re-stock appetizers frequently on the serving table, rather than setting out all of the food at once.